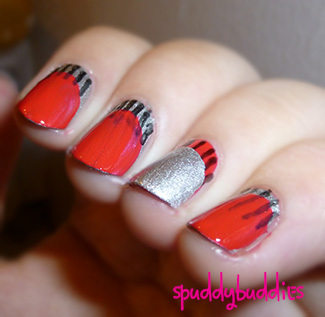 This was one of my older designs and my first attempt at ruffian nail art. I really liked the concept of having this slight curve of color peeking out from a coat of color above it. Also, once upon a time, I attempt to do a half-moon mani but that turned out horribly. 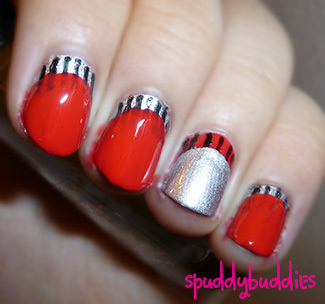 I used Sally Hansen - Silver Sweep as my silver, a red-orange polish for my accent nail and a black nail art pen to do the stripes. I'm not sure why I did the stripes but I'm glad I did because they turned out cuter than expected and it gives my ruffian nails a bit of an oomph. 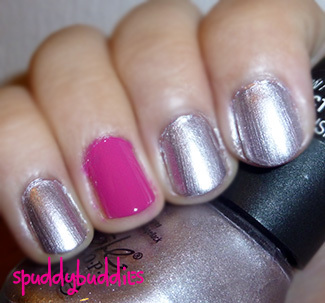 On my right hand, I used Nicole by OPI - Light a Candle (a silver-lavender polish) and a pink polish. This was the first coat of alternating color above the base color. I thought the red polish would be opaque over the silver but it didn't quite turn out that way. So I tried two coats - still not much better but not too bad either. Initially I wasn't a big fan but the more I looked at it, the more I liked them. Hah! Here's my right hand after trying to paint the curve of the second color neatly. My pointer finger didn't quite turn out as nicely as I wanted it to be but the rest were okay. I also used 2 coats of the alternating polish. How do you find ruffian nails? Or do you like the half-moon design better?